Asset Library Folder 1 contains: Journey Map, Everyday Explanations, Ring Cycle, and Male Messaging. Asset Library Folder 2 contains: Starter Kit and Lady Talk Counseling Cards. Over the last decade, great strides have been made in slowing the HIV epidemic: the number of HIV-related deaths dropped by 45% between 2005 and 2015, 18 million people living with HIV are receiving treatment, and many countries are on the verge of eliminating transmission from mother to child. Yet since 2010, declines in new HIV infections among adults have stalled. And in sub-Saharan Africa, the burden of HIV/AIDS falls disproportionately on young women. To meet our goal of an AIDS-free generation, a focus on treatment isn’t enough – we also need new tools for prevention. To that end, significant investments have been made to develop microbicide products for HIV prevention among women. This new generation of ‘women-initiated technologies’ has the potential to shift dynamics and give women more varied options to manage their own sexual health. While multiple products have demonstrated protective efficacy in clinical trials, consistent use among young women has been troublingly low. Without consistent use, these products cannot protect women. To encourage uptake and consistent use, young women need product user experiences designed with their values, needs, and lifestyles in mind. 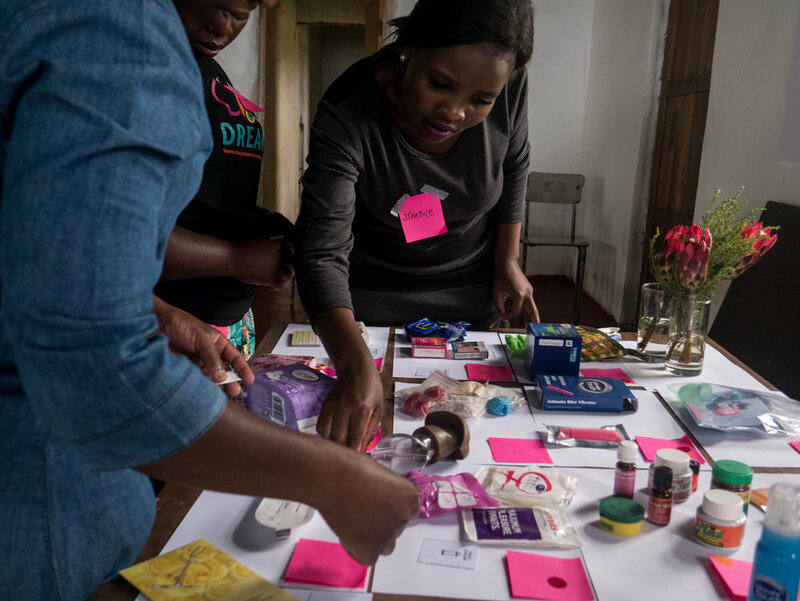 To that end, USAID’s Office of HIV/AIDS and USAID’s Center for Acceleration Innovation and Impact – along with the International Partnership for Microbicides – sought to better understand the daily lives of at-risk young women with a human-centered design approach. Using human-centered design, this project looked at ways to increase and sustain use of the daprivirine ring – the first long-acting, woman-controlled method for reducing the risk of HIV infection – by better understanding and engaging young Sub-Saharan African women (18-24) and their influencers in the patient journey. While our partnership focused on the dapivirine (DPV) ring, our goal is for this research to be broadly applicable to reaching young women with HIV prevention products. User research was conducted in South Africa and Uganda, countries where the DPV ring can make a significant impact in preventing HIV infections and countries in which clinical trials for the DPV ring took place. I test for HIV, but I can’t make him do it. It’s hard to tell yourself that you are sexually active, and you need to go to the clinic to learn how to protect yourself. A defining characteristic of the human-centered design process is that it prioritizes talking to and collaborating with the people who are most likely affected by the development of a new intervention or program. For this project, we interviewed young women and their partners, healthcare providers, community leaders, and implementing partners working in the communities. We visited local communities, clinics, and young women’s homes, and held workshops with young women and their influencers to understand the issues and concerns informing decisions about sexual and reproductive health, generally, and HIV prevention products, specifically. Insights from these activities informed our concepts which were iterated upon through rapid prototyping based on feedback received from users, communities, and collaborators. To establish a baseline understanding, the team interviewed experts, reviewed extensive secondary research, including landscaping and stakeholder analyses, and conducted literature reviews to understand young women and their influencers. This input informed the research approach for the next phase. This research helped the team develop hypotheses of insights - further validated in the research stage - that served as key jumping off points for the design concepts and strategies developed. 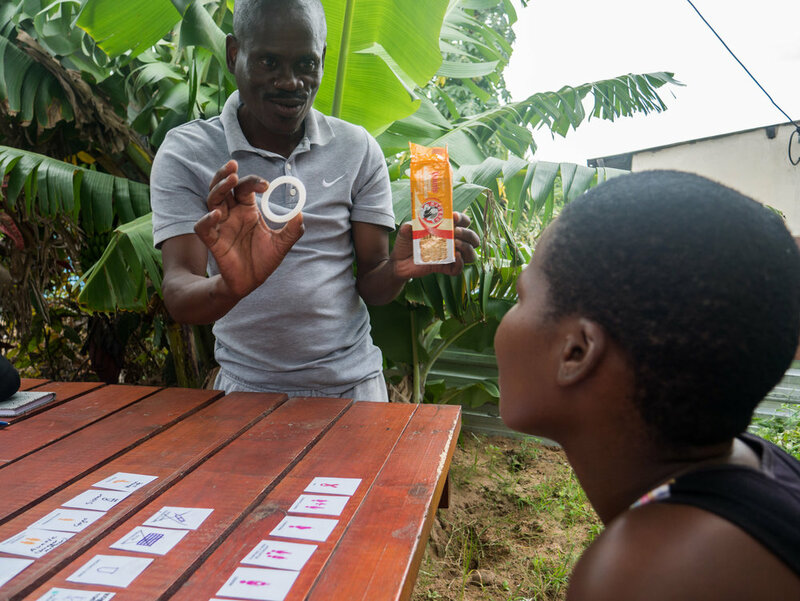 Insights shape the sexual and reproductive health journey of potential DPV ring users - the above journey map summarizes insights, key ring moments, and relevant design concepts at each stage of the user journey. To understand existing needs and behaviors, the team emphasized deep, participatory engagement through qualitative research methods to understand the lives, needs, expectations, and behaviors of different users and stakeholders across the health system. We tested insights developed in the immersion phase and synthesized observations into insights about the barriers to, and opportunities for, the uptake and consistent use of the DPV ring. Clockwise from top: (i) one-on-one interview with young woman, (ii) scenario-based activity (mad-lib style) elicited a range of stories, mental models, and opinions from participants via acting, (iii) ecosystem cards constructed a picture of the issues, influencers, places, and products in a young woman's world to map how the ring fits in, (iv) girl talk events created safe (and fun!) opportunities to talk about health, beauty and relationships, (v) sexual and reproductive health gallery piqued curiosity and gauged preferences about sexual health decisions and preferences, (vi) lady talk WhatsApp groups unlocked additional insights from young women participants via posing simple questions about life, beauty, health, and relationships. In the concept phase, the team translated opportunities into concepts, making heavy use of participatory and collaborative sessions with end users, their influencers, key stakeholders, and implementing partners. Together, the design team and partners generated and voted on concepts, constructed rapid prototyping of promising ideas, and then took these ideas into communities to get additional feedback and inspire new concepts. Of course, there is no one common journey across all young women - opportunities and barriers differ between individuals. For that reason, research sought to uncover personas, stylized descriptions of target user profiles - each with clear and differing needs, motivations, and behaviors. Personas help us understand how key variables (e.g., family structure, relationship status), beliefs, and behaviors might influence attitudes towards the DPV ring. Personas can contribute to product launch strategy by pinpointing users that might be more receptive to a new prevention product or users that might be more influential within their communities. Six priority personas relating to ring access and use were identified. See Section 3 of the Guide for additional detail on the personas. Personas were organized by a simple framework of key factors that influence ring access and use: (i) individual empowerment and (ii) external support. While each persona occupies a specific position within the framework, a given individual can shift between different personas over the course of her life. 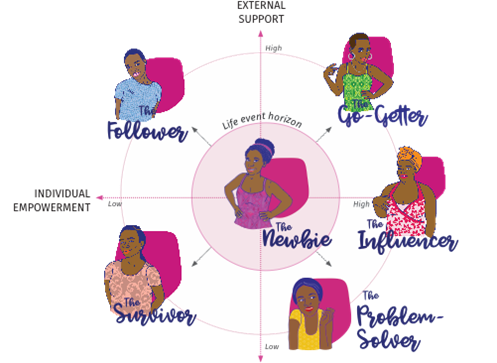 Younger or less experienced women, like the Newbie, may begin in the center and move outward, evolving into one of the more developed personas. The publication has two parts: (i) the Guide which gives an overview of design concepts and how they were developed through user research, journey mapping, and persona development and (ii) a Supplementary Asset Library which provides resources, such as editable templates and supporting visuals for select concepts. These files provide a starting point for adapting existing concepts according to the needs of the communities and stakeholders served. Everyday explanations: messaging material that contains key questions asked by a relatable user, reassuring answers given by an informed nurse, and 'everyday explanation' answers with an easy explanation, body or drug information, a cementing analogy, and a clear visual to help women "get it"
Outside of the design concepts highlighted above, other design concepts include choice tools, starter kits, ring point person, ring ping, ring report, lady talk counseling tools, health hub, ring couples and peers, and talk tools.